We run quarterly vulnerability scans to protect our customers' websites from new vulnerabilities. Curious what a passing scan looks like? Download a sample now. Download a sample vulnerability scan to see what a passing scan looks like. Are you curious to see what a passing website vulnerability scan looks like? 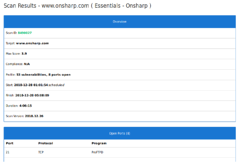 Use the form on this page to download a sample scan from our Onsharp website. Every second that your website is online, there is a risk of a hacker taking advantage of some new vulnerability to gain access to your website. Best case is that the hacker will do something to start showing annoying popups on your site, and worst case it that they will secretly hijack your website, steal sensitive customer data, proprietary business information, and other data that is critical to the profitability of your business.